In Kenya and Uganda, climate change has affected the balance of nature, causing heavy rains which have led to massive flooding. The flooding has destroyed homes, crops and livestock, wiping out the food supply and creating a need for international assistance. Zakat Foundation of America (ZF) has been one of the first organizations focused on helping victims of climate change in Kenya and Uganda. In Uganda, ZF is fighting malaria by distributing long-lasting insecticide treated mosquito nets. 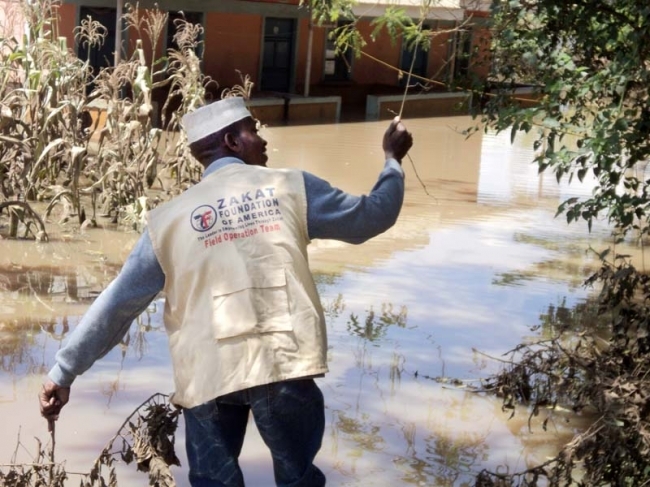 In Kenya, ZF is distributing food packages to provide emergency relief to flood victims. Food packages, containing maize, beans, wheat flour and cooking oil that will last for the next three months are being distributed to flood victims. ZF is also distributing hybrid maize seeds for long-term food relief, meant to be harvested after three months, providing food to flood victims once their food packages have been depleted. The crops they cultivate will provide them with enough food to last until the next planting season. In addition to food distribution, ZF is also providing Emergency Relief Packages to families in need. Relief packages are put together according by volunteers and with the ZF Ration Cards, families have been able to get the things they need to make life easier. A number of flood victims have expressed gratitude that a Muslim organization like ZF has come to their aid; the first time since flooding in the region in 1961. As of today, families affected by the flood are able to turn to ZF for food packages and Emergency Relief Packages for survival. We continue to stand by victims of climate change around the world. Donate to the Emergency Flood Relief Campaign in Kenya and Uganda to provide food, medicine, and personal products to flood victims today.